You can support the ongoing ministry of Yokefellow Prison Ministry of N.C., Inc. in a number of ways. The most important way to support Yokefellow is through your prayers. Please pray for the ministry, including the Volunteers, Local Coordinators, Board of Directors, and Staff as well as the inmates and prisons they serve. Pray for the spiritual growth of everyone affiliated with Yokefellow and that the ministry will operate in unity as all follow where God leads. Currently, Yokefellow only serves 2/3 of North Carolina’s prisons. To achieve our vision of serving all 57 prisons in North Carolina (55 state prisons and 2 federal prisons), Yokefellow needs more volunteers. 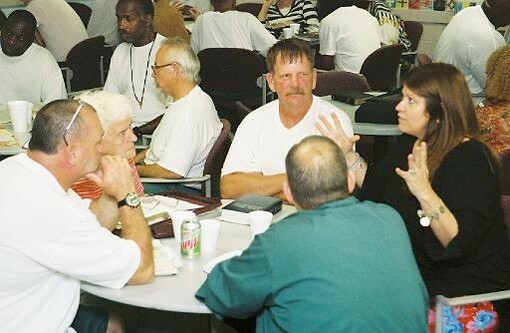 Prayerfully consider joining us in ministering to inmates in a prison near you. While most of the people affiliated with Yokefellow are volunteers, Yokefellow employs two staff members to run the day-to-day operations of the ministry and oversee the training of volunteers. Yokefellow’s primary costs are paying staff salaries, training costs, and mailings to volunteers. Yokefellow depends upon the donations of those who believe in its prison ministry vision to continue operating as a healthy ministry. Yokefellow is happy to receive in-kind (non-monetary) donations that it will sell, using the proceeds to cover ministry costs. For example, Yokefellow is happy to receive gift-share donations, which benefit both Yokefellow and the donor: Yokefellow receives the full market value of the gift, and the donor enjoys the added tax benefit of avoiding having to pay taxes on capital gains for the increased value of the stock being donated. Talk with your financial adviser about how this works. Yokefellow is also happy to receive other donated items of value that can be “auctioned off” at silent auctions at fundraising benefits. Donors receive a receipt for the fair market value of the item on the date it was donated. Email yokefellowprisonministrync@gmail or call 336-724-9801 to inquire whether Yokefellow can accept a particular item as an in-kind donation for future fundraising benefits or direct sale. Want an easy way to support Yokefellow that costs you nothing? Sign up for a free Amazon Smile account through Amazon.com. Type https://smile.amazon.com/ch/56-1059009 into your Internet browser. Then, sign in to your Amazon.com account. You will see a message telling you that Amazon will donate 0.5% of your eligible Amazon Smile purchases to Yokefellow. After this, whenever you plan to shop through Amazon, go to smile.amazon.com to do your shopping. Amazon will automatically donate 0.5% of your eligible purchases without you having to do anything else. It’s an easy way to support Yokefellow whenever you shop online. Do you want to continue supporting Yokefellow even after God has called you into glory? Consider including Yokefellow in your Last Will and Testament. Talk with your estate planning attorney or financial adviser to learn how to do this.